Unused, original sticker from 1984. Measures 7" x 3". 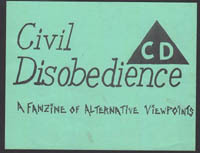 Original 1982 sticker for this Las Vegas fanzine. Unused with minor staining. Measures 5½" x 4½". Impress your friends by sending 'em a record with an original, unused Max's Kansas City mailing label! Circa 1976. 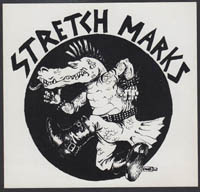 Original fluorescent orange 1981 sticker for this obscure NY band featured on the Staring Down The Barrel compilation. Most often spotted as an insert with their EP. Measures 7" x 5½". 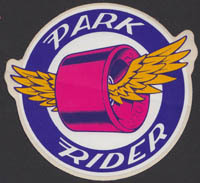 Circa 1983 original unused sticker. MACback brand backing. Measures 5" x 5". Original, unused sticker circa 1983. Measures 4½"x 5½". White Starliner backing. 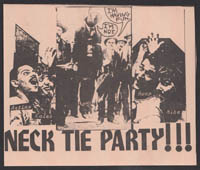 Set of four Second Annual Report hype stickers from the 1978 repress on Fetish. Will consider selling individual ones at $40 a piece.